While printing on SSCC printers is free for full members of the Cooperative, lab users can print in the SSCC computer labs by paying for it through GoPrint. To use GoPrint you will need a valid UW NetID and money on your WisCard account. To add money to your account or for more information on WisCard, please go to http://wiscard.wisc.edu. You will be charged a $2.50 processing fee to add to your balance online.You can add money to your WisCard for free at the Memorial Union WisCard Office. Use the PostScript drivers if you're having trouble printing a particular document—usually a complex journal article. 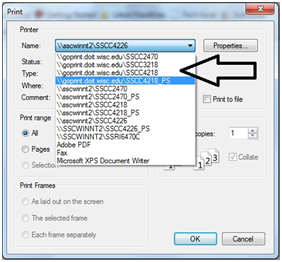 Note that you can only print to GoPrint using one of the SSCC lab computers or a computer that logs into SSCC's PRIMO domain. You cannot print to it from personal computers. Once you have chosen the correct printer, you’ll be prompted to sign in to GoPrint with your UW NetID and password, then select your print jobs and choose Pay and Print. Printing costs $.07 per page (i.e. per side of a sheet of paper). If you need to print a single page, set the printer to print it single-sided or you'll be charged for both sides. If a problem with GoPrint prevents your job from actually printing, you can request a refund at https://it.wisc.edu/printing-problem-refunds/. Refund requests are reviewed by both DoIT staff and SSCC staff. If you are an SSCC member, your printing is paid for by your sponsoring department or agency. This is intended for printing related to University business (i.e. research and instruction, though some departments ask you to avoid using the SSCC printers for instructional printing). If you need to do some printing for personal purposes, you should pay for it using GoPrint as described above. However, you'll need to contact the Help Desk first and ask to be added to the group of SSCC members who have access to GoPrint. Printing for commercial or political purposes is strictly forbidden no matter how it is paid for.